Exceptional and Rare Round Grid Coffee Table By Gio Ponti for Giordano Chiesa. Italy Circa 1945-1948. La Casa All'Italiana. 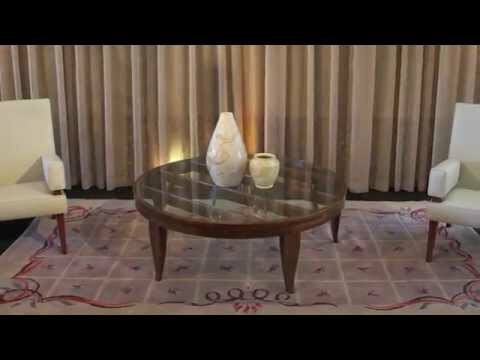 Gio Ponti in L.A, Residence of the Consul General of Italy, Los Angeles, June 20-30, 2013. Casa Licitra, Licitra-Ponti Family, Italy. Certificate of authenticity from Lisa Licitra Ponti with the Gio Ponti Archives stamp. Authenticated by Gio Ponti Archives, Milano. Arredamento Moderno, Roberto Aloi, 1939. "GIO PONTI" by Ugo La Pietra, p.58 fig.133, p.61 fig.139. "GIO PONTI" by Lisa Licitra Ponti, the complete work 1923-1978, p.82. La Casa All'Italiana. Gio Ponti in L.A, exhibition catalog 2013. The two last pictures show the table while it was displayed at the exhibition consecrated to Gio Ponti, at the Consul General of Italy residence. Measurements: Height - 17 3/4" x Diameter - 51"